One of the most versatile and sought-after vehicles on the Toyota line just got better than ever. The 2017 Toyota Camry Hybrid in Janesville, NY takes everything you loved about the original Toyota Camry and makes it more affordable. Combines a powerful performance with and efficient fuel economy and a comfortable interior to create one must-have of a car. So whether you need a family car that’ll actually fit in your garage or a commuter car that won’t break the bank every week, the 2017 Camry Hybrid is a great choice. Under the hood of the 2017 Camry Hybrid sits a sealed nickel-metal hydride hybrid battery pack paired with a 2.5-liter, 4-cylinder engine that work together to provide excellent performance along with its top-of-the-line fuel economy. Take a look at the chart below to learn more about the features available with the 2017 Camry Hybrid. We all know that there are plenty of reasons to like the 2017 Toyota Camry. Between its powerful drive that outdoes even the original Camry and its excellent money-saving fuel economy, there’s no reason you shouldn’t get behind the wheel of the 2017 Toyota Camry today! 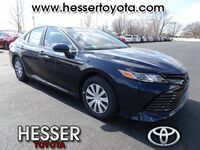 And with Hesser Toyota located right here in Janesville, WI, it very possible that we could have the model you’re looking for in our inventory. If you’d like to learn more about the 2017 Toyota Camry and the available features available inside both models, click here! Be sure to contact us here at Hesser Toyota if you’re interested in learning more about the 2017 Toyota Camry Hybrid, or if you’d like to be the first to take it out for a test drive when it arrives on our lot. Just give us your contact info and we’ll be sure to contact you as soon as it becomes available.